A male seen at Lake Baringo National Park, Kenya. October 2016. 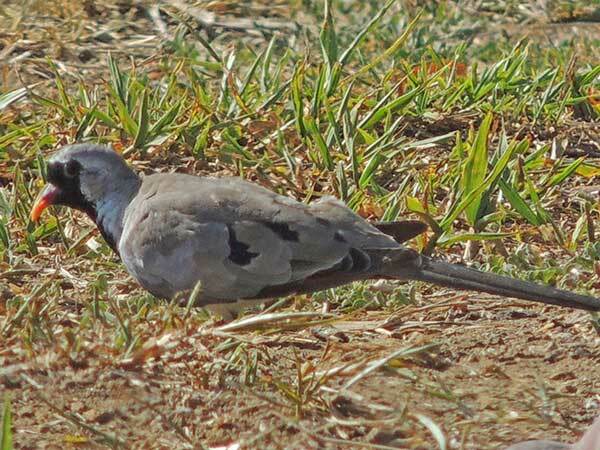 A small dove that often forages for seeds and flower buds on the ground and that has a long, slender, tapered tail feathers. The male is more striking in its plumage: The face and upper chest are black while the bill orange-red. Reddish-brown feathers in wings visible in-flight. Copyright Michael J. Plagens, page created 19 Jan. 2017.